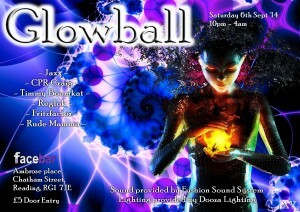 or the first time in several years, Glowball makes a one off special return, but this time its at the Facebar. Who is playing: Jaxx, CPR Craig, Timmy Boomkat, Reglok, Fritzfactor, Rude Mamma. As usual the sound is by Fushion and the lighting by me, Dooza. Posted in Dooza Lighting, Lighting and tagged Glowball.